APIs are like websites: they are available most of the time, but unfortunately not all the time. Website and application performance monitoring startup WatchMouse monitored the uptime of 50 of the most popular APIs (as ranked by ProgrammableWeb) for a month to see which are the most reliable – and which ones are rather flaky. WatchMouse, which also publishes API statuses in real time at API-Status.com, found that ten of them performed without a single hitch between February 16th to March 17th, including goo.gl, Quora, eBay, Google Maps and Basecamp. A number of APIs, namely those from Digg, GeoNames, Gowalla, Posterous and Eventful performed rather poorly, but ailing Myspace takes the cake in terms of unreliability. Needless to say, a lot of websites and applications rely on APIs for their own businesses, so uptime is important to avoid that nasty domino effect to kick in. The methodology for testing the sites for this particular report includes one simple API call plus check for a valid result, which means that it’s not exactly an in-depth functional test of the full APIs, but could still be used to evaluate whether one should rely on certain APIs for business purposes. The full report is available here. 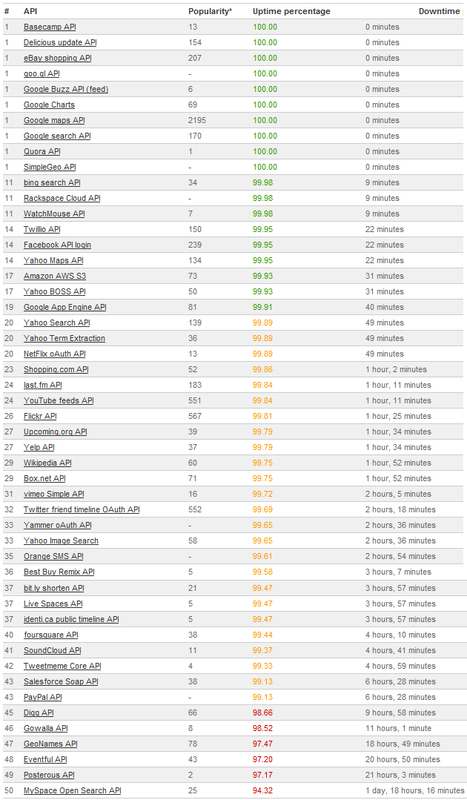 The API checks were performed every 5 minutes from the 56 WatchMouse monitoring stations worldwide. Errors are used to count towards the percentage of availability or uptime for each of the sites.